TV size VS room size. LCD vs Plasma vs LED: which is better? Yes, the question is rather difficult, but again the choice can be made basing on your room. The rule is simple: LCD looks better in bright rooms, Plasma in dark ones. What about LED? – LED models are actually LCD monitors, but with light emitting diodes backlighting, so they are also good for bright rooms. Confusion with resolution (720p, 1080p). Considering TVs with 720p and 1080p resolution we should mention the rule “The bigger, the better” again. But not because this rule is true, but because modern manufacturers of TV sets make us think this way. So is there a great difference between these numbers? Will you really notice it? There may be two variants. If you get a unit with 50″ diagonal or less, you won’t probably see any difference. If you put two models with 720p and 1080p resolutions and will sit in front of them at the distance of about 8 feet, they will look the same to you. Sharp picture is guaranteed. But what about larger sets? – In this case 1080p will have more tightly pixel structure, but this has nothing to do with sharpness. If you sit next to such unit, very close, then you won’t notice any stair-stepping lines or space between pixels. The last, but not the least, is the content that you are going to display. Nowadays most channels broadcast their programs in1080i and 720p. If you are a gamer, then you should also know that such consoles, like Xbox 360 or PlayStation 3, for instance, have 720p native resolution, but of course some of them have settings that allow you to convert the titles to 1080i or 1080p. In general models with 1080p resolution are mainly chosen by real movie buffs and avid gamers. Trick with refresh rate (60Hz, 120Hz, 240Hz, 400Hz, 600Hz). Refresh rate is one of the most disputable issues in modern world of television. We would like to remind you that these five numbers (60Hz – 600Hz) are responsible for the number of times the image is renewed on the screen. But does your eye can see this advertised difference? According to numerous research and tests’ results a human eye can hardly see any difference between 240Hz and 400Hz. Most manufacturers of TV sets state that higher refresh rate insures smooth picture and no blurring, but these are two, absolutely different effects. Modern companies use various technologies, in order to provide these widely-advertised visual effects, but the most popular are: MEMC (motion estimation – motion compensation) and Scanning Backlight. So is it just a marketing ploy? – Refresh rate is a rather relative term. As the proverb states: “All good things come to he who waits”, so if a viewer is looking for a difference, he will find it. Can you show a rainbow? Contrast ratio is another advertising gimmick. Have you ever heard of the standards for contrast ratio reporting? – Probably no, because such standards don’t exist. In fact these term means the difference between the brightest white and the darkest black, displayed by a TV set. 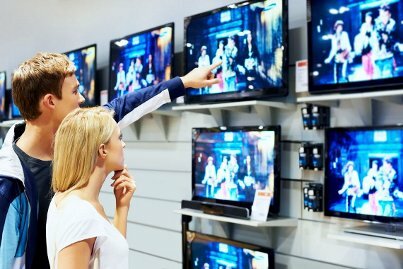 So how to choose a decent TV with accurate colors? – Visit showrooms, read customers’ reviews and just visit shops to see the picture quality with your own eyes. TV type (Plasma, LCD, LED): standard Plasmas consume twice as much power, as traditional LCD. Nowadays LED units are considered to be the most energy efficient, due to the usage of light emitting diodes for screen backlighting. Screen size: the principle is simple “the bigger the unit is, the more power it consumes”. For instance, LCD model with 32″ screen uses, approximately, half as much electricity, as a 52-inch unit. Picture settings is the only energy saving factor that can be controlled by any viewer. The brighter the picture, the more electricity is consumed, so don’t overdo, adjusting your set. Standby mode is a tricky thing. TV sets use electricity even when they are not turned on and tests show that the amount of consumed energy varies from model to model. According to Energy Star standards units should consume less than 1 Watt, so consider this, leaving for vacations. Source: 3D-compatible TV won’t provide you with expected effect itself. In order to get a three-dimensional picture you should also use 3D Blu-Ray players, cable or satellite box, game console or streaming video device. Content: Unfortunately there are still not so many channels that broadcast programs and movies in 3D. The number of 3D Blu-Ray discs keeps growing, but currently there are only about 100 of them. Wait for free 3D glasses? – In vain. The majority of TV manufacturers don’t provide free 3D glasses, so you will have to buy them separately. Ready for extra expenses? Would you like to be Smart? Internet support is a very attractive feature for modern customers. Various video (f. ex. Netflix, Hulu Plus), audio (f. ex. Pandora, Rhapsody), photo (f. ex. Picasa, Flickr), communication (Facebook, Skype, Twitter) services and much more. But before overpaying for a Smart TV it is important to remember that such units require Ethernet link-up or Wi-Fi adapter. Besides similar features may be available on other devices, like Blu-Ray player, PlayStation 3, TiVo, Xbox 360, etc., so are they really worth paying extra? Do you like to flash plashes of sunlight? On the one hand, television sets are mainly available with glossy screens and it is not the best option for bright rooms with much sunlight. Only if you are fond of playing with plashes of sunlight. On the other hand the choice of models with matte screens is limited. So every stick has two ends. Don’t become a victim of the market and make your choice wisely.